Beat This Caption Contest 209 Winner – Caption Contest Funny Clever Witty Enter Today! There, that’ll wash that nasty spider outta my shoe! 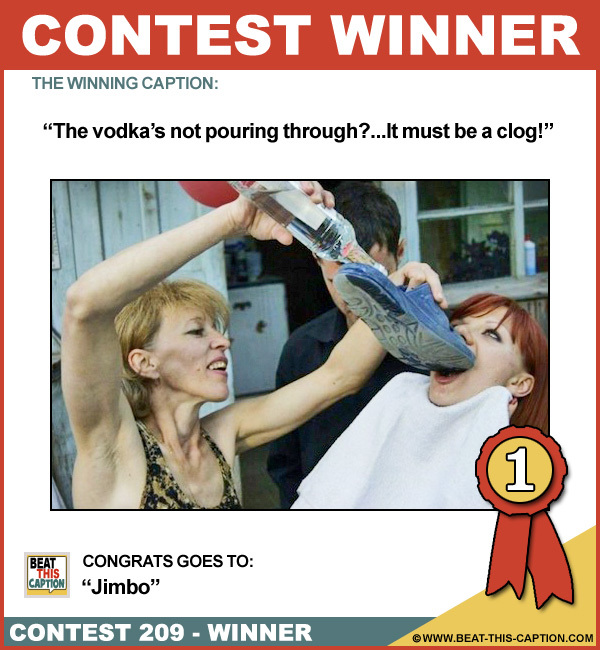 The vodka’s not pouring through?…It must be a clog! Liquor in the Front…Poker in the Rear! Brenda’s a shoe-in to win the drinking contest! One more bottle and the doctor can operate to remove that hideous blue growth on your upper lip! This is the first step of your 12 step AA program! Jane’s favourite croctail is a Mojitoe! Home remedy for Meth Breath!